Geology can be strange. Outrageous. Bizarre. I'm sure you've all run into formations and landscapes and concepts that have left you scratching your head. Maybe they got less weird later. Maybe they stayed strange. But however transient or permanent that weirdness was, it got weird. So tell us about it. Hit us with the strangest stuff you've got. I'm late to the party, but what's new? I see a lot of weird stuff in my travels, but what strikes me isn't so much the geology, but our weird response to the geology. Can you look at the rock in the picture at the beginning of the post and not see the face of monster trying to emerge from the ground? The rock results from a random process of weathering and erosion, but see it from the right angle, and the rock becomes of mythical story of beasts and human nightmares and heroes on quests. Perseus fought Medusa, who turned men to stone. 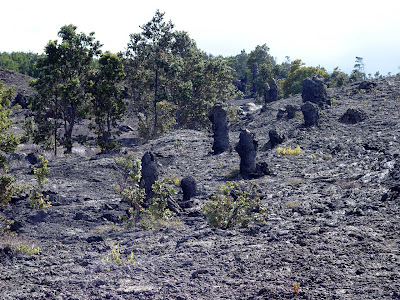 Tree molds in Hawaiian lava flows were people turned to stone (above). The volcanic necks of the Four Corners region were the monsters who were vanquished by the Navajo Twins Monster Slayer and Child-Born-of-Water (below). Pareidolia is a psychological phenomenon "involving a vague and random stimulus (often an image or sound) being perceived as significant. Common examples include seeing images of animals or faces in clouds, the man in the moon or the Moon rabbit, and hearing hidden messages on records played in reverse". It's part of being human, the recognition of human faces being one of the most important skills of a newborn baby. Of course, such things can get out of hand when we start seeing Jesus on tortillas, or faces on Mars that are obviously signs of Martian civilization (I thought it was Elvis myself). Or the Devil smiling in the smoke and ash of the Twin Towers burning (wasn't there enough evil in the hearts of the terrorists?). What's Eating the Joshua Trees? What's Not Eating Them? For some reason, the powers-that-be somehow failed to call the incredible geological desert in Southern California "Great Big Granite Boulders National Park". They called it "Joshua Tree National Park" instead. I don't quite understand, but that's the way things go sometimes. Really though, the bizarre little 'trees' have a geological history, and it may be their undoing. 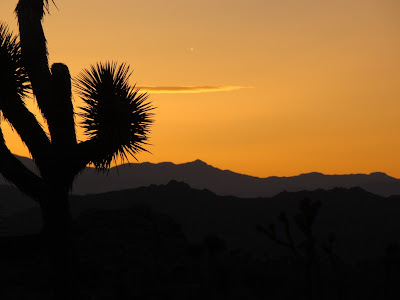 The Joshua Tree is actually a member of the yucca family (Yucca brevifolia, meaning short-leaved yucca), and is so closely associated with the Mohave Desert that the boundaries of the one practically coincide with the other. The "trees" grow to a height of 35-40 feet, and are a centerpiece of the Mojave ecosystem, as many animals shelter within the tree and underneath it. 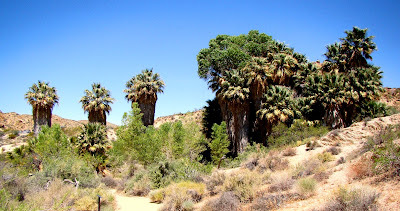 The trees have a symbiotic relationship with the Yucca Moth, in which the moth is pretty much the only organism that pollenizes the flowers, and the larvae of the moth pretty much eat only the seeds of the Joshua Tree. The iconic trees of Joshua Tree National Park are threatened, and as is often the case, we have met the enemy, and he is us. Human generated global warming is raising temperatures in the California Desert, just as it is everywhere else. 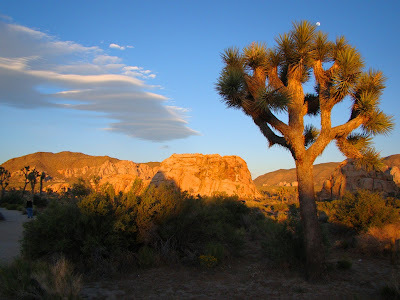 Joshua Trees are sensitive to such climate change and are no longer propagating in the hotter areas of the park. As the climate warms, more and more trees in the lower edges of the desert will disappear. Normally they would propagate in higher cooler parts of the park, but there is a complication...the problem is a load of crap, or more properly a bunch of dung that is no longer being made. Today, the only animal that transports Joshua Tree seeds is the woodrat, but they don't move much more than a 100-150 feet from the trees. 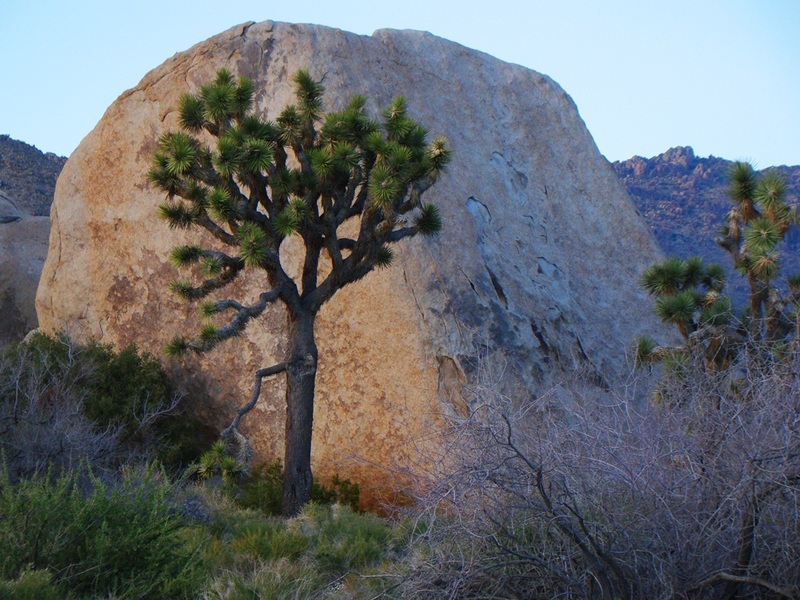 That's not far enough to get the seeds to higher, cooler elevations, and so there is a possibility that within 50-100 years, most of the Joshua Trees will be gone from Joshua Tree National Park, just as the glaciers will be gone from Glacier National Park. There will be places at the north edge of their range where they will be able to survive, but they may have trouble getting there without human assistance. So how did the trees get around in the past? That's where the dung comes in (or out...). It seems that we have discovered the droppings of giant ground sloths which once lived all across the southwest. It seems odd that we would have examples of their, uh, reprocessed food, but some of them favored dry caves and there are lots of samples to work with. And they contain a lot of Joshua Tree seeds and leaves. It is pretty clear that sloths provided mobility to the seeds of the Joshua Tree, and when they went extinct 12,000-13,000 years ago, the range of the Joshua Tree began to decline during the climate disturbances in subsequent Holocene time. 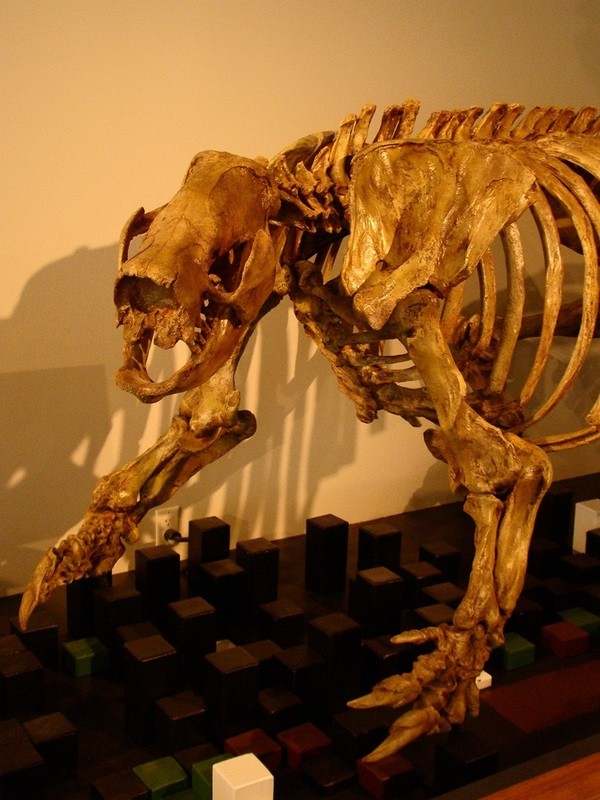 The picture above is a Harlan's Ground Sloth on exhibit at the Fossil Discovery Center near Madera in Central California. Despite the ferocious looking claws, it was probably a rather peaceful creature. I just hate that we cannot witness the wonderful menagerie of creatures that lived in North America just a few thousand years ago, although a few were probably the stuff of human nightmares (a future blog on this will be forthcoming). It occurs to me that instead of having humans simply plant Joshua Trees to insure their survival, we should be following a more logical solution. Doesn't it make more sense to use the DNA of the sloths to reproduce new sloths a la "Jurassic Park", and then release them into the wild to do the work that they were meant to do? How hard could it be, really? 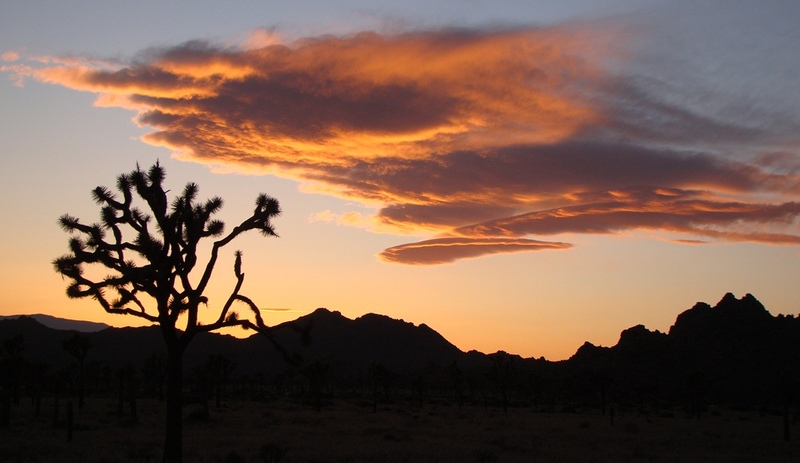 For more info on the Joshua Tree and climate change problem check out this NPR story. 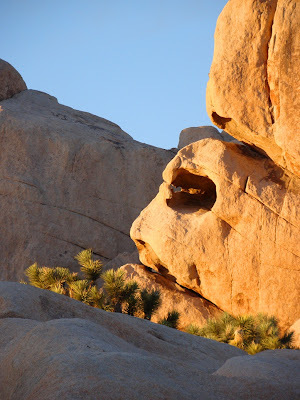 Joshua Tree National Park has a bit of a schizophrenic aspect. 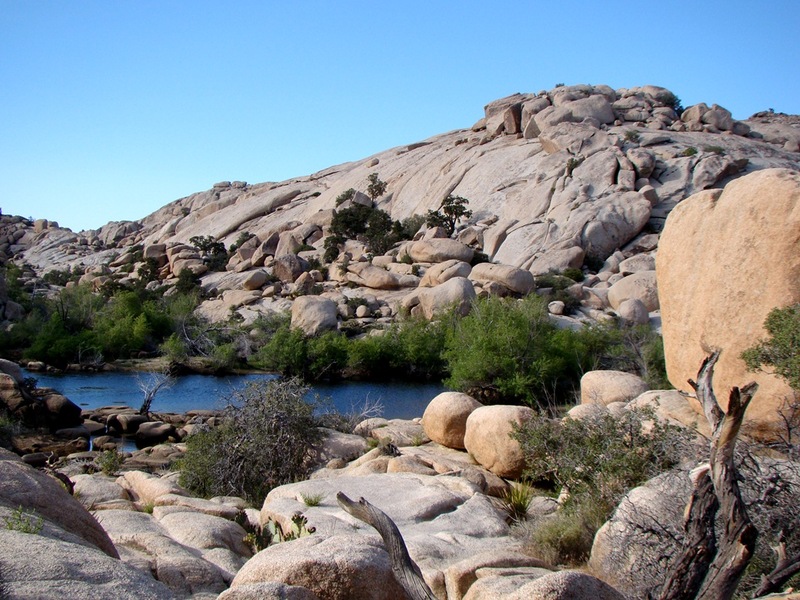 Geologicially, the park is divided into vast tracts of metamorphic rock separated from large areas of granitic rock. 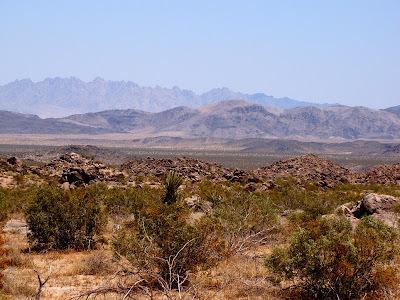 Topographically, the park is divided into the higher Mojave Desert and the lower Colorado Desert (the High Desert and Low Desert of SoCal weather reports). The elevation and rock differences result in large contrasts in water availability, and thus vegetation; the iconic Joshua Tree is not found in the lower parts of the park, for instance. 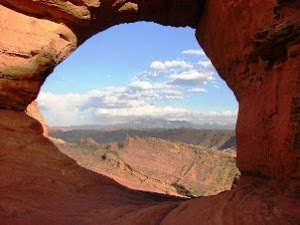 The higher parts of the park exceed 3,500 feet, and the climate is cooler and wetter ("wetter" being a relative term), and this higher elevation desert even receives the occasional snow flurry in winter. 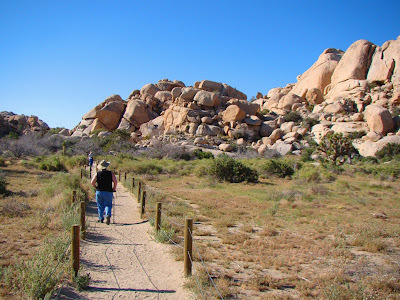 My vivid memory of January camping at Joshua Tree as a Boy Scout was that of coldness, absolute extreme cold (probably merely close to freezing, but I was a southern Californian; we panic when the temperature drops below 50 degrees). There's more water in the high desert, enough that the landscape could almost be classed as savanna. These higher elevations supported enough grass that a few ranchers scratched out a living in the region. Cattle need water, but the water doesn't flow at the surface much of anywhere in the park. The ranchers built a few small dams in scattered drainages to catch the runoff from rare rainstorms. These so-called tanks were of varying quality, and some have fallen into such disrepair that they no longer hold water, but others survive. 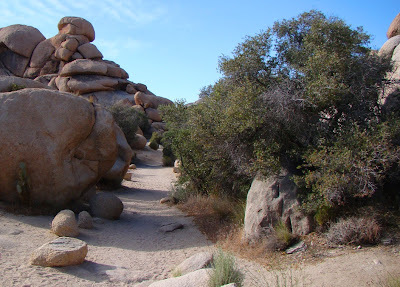 One of the nicer (and popular) short hikes in the park visits Barker Dam in the Wonderland of Rocks area. We had a pleasant stroll there last week, on a sparkling clear day. With a bit of revegetation effort and pathway control, one can see how grasses could almost support a cow, although the measure would be acres per cow rather than cows per acre. The grazing no doubt put severe pressure on the local population of bighorn sheep, who are occasionally seen in the vicinity of the reservoir. 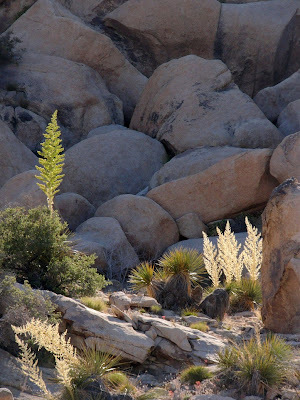 The trail winds past some unique desert oak trees and a variety of yucca called Parry Nolina, which blooms into the showy stalks seen in the picture above. The bedrock in the area is entirely composed of a variety of granite called monzogranite, which formed deep underground as magma, and cooled slowly to produce the crystal-rich rock. As the granitic rock was exposed at the surface, expansion and stresses caused the rock to fracture along joints which became the focal point of weathering and erosion. The boulders weather more readily at corners and edges, giving them a rounded aspect. The process is called spheroidal weathering. 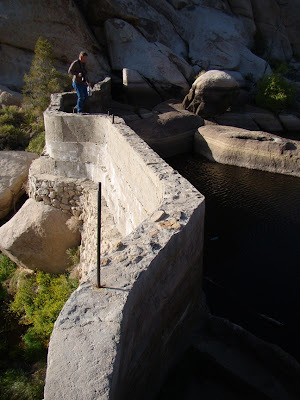 Closer to the dam, the rock is less jointed, and breaks mostly parallel to the surface, forming a dome-like structure, which is a relatively rare sight at Joshua Tree, and more familiar in places like the Sierra Nevada. This is the process of exfoliation (below). The little reservoir captures the rare runoff from thunderstorms, and the resulting lake attracts all manner of birds, insects, mammals and other creatures, including tourists. A look at the dam reveals what probably amounts to a lack of sophisticated dam engineering, but it has lasted for more than sixty years. The area downstream of the dam is a beautiful landscape of rock and vegetation. A number of petroglyphs and pictographs (some unfortunately recent) can be found hidden in these rocks. The ranchers had probably built on top of a natural reservoir in the rock, and the area has been a source of water for a long time. It is, of course, a cliche to say that water is life. I can barely imagine a more terrifying thought than to be trapped in the open in a place like the Pinto Basin in Joshua Tree National Park (above) on a scorching hot summer day without a car, without a phone (no coverage anyway), and without water. 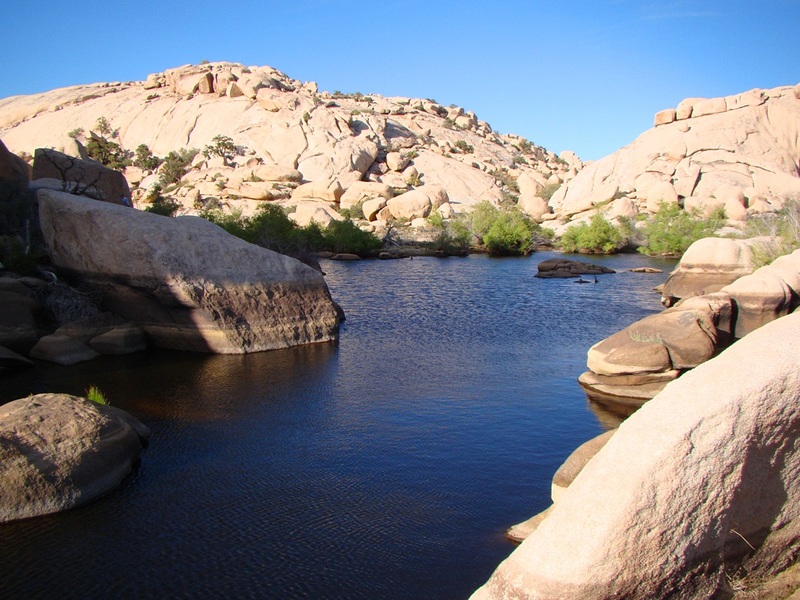 The Pinto Basin is the rarely visited wilderness end of Joshua Tree National Park, a place far removed from the famous granite boulders of Wonderland of Rocks or Hidden Valley. The Pinto Basin is a vast alluvial plain crossed by two old dirt tracks leading to abandoned mines, and nothing else. The Pinto Basin was never developed like other desert basins in California because of a lack of available water resources and the arrival of the Great Depression just as speculators were moving into the region. The establishment of the monument sealed the deal and protected the wide basin from any more development. It wasn't always like this. 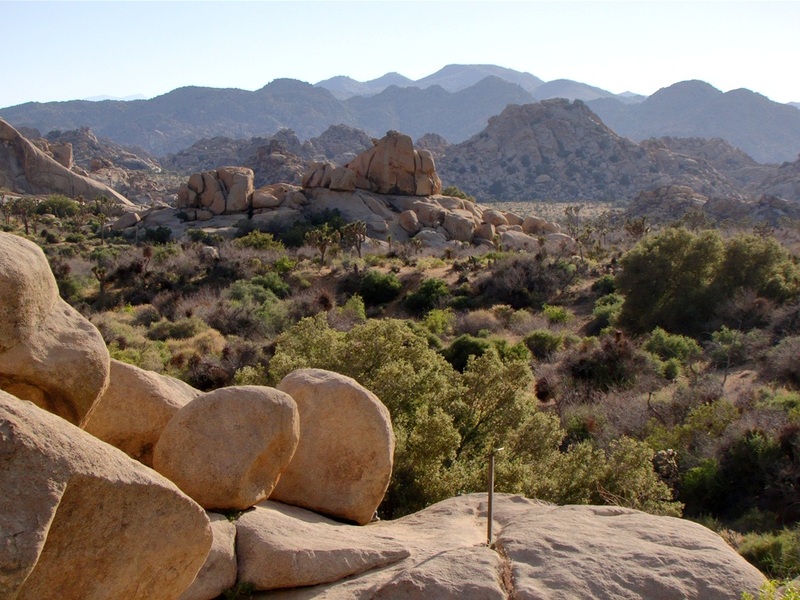 Studies at Joshua Tree have established that the region was more tropical for millions of years, and that during the Ice Ages a stream flowed through the valley. It was a place where humans could thrive instead of simply surviving. Archaeological work has established the presence of a people (the Pinto Culture) that lived in the basin from around 9,000 to 2,000 years ago. Water is precious in the desert, and there are precious few sources there today. Ironically, the source of the water that is there is the same as the water the Pinto People used thousands of years ago. 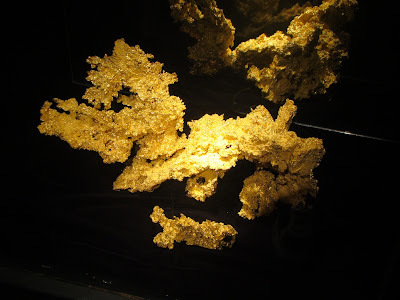 The gravels of desert basins like the Pinto act like giant sponges, storing water in the spaces between sand grains in the thousands of feet of loose sediment filling the valleys. Billions of gallons of Ice Age water remain hidden deep in the sediments, revealed only when geological conditions force water to the surface. 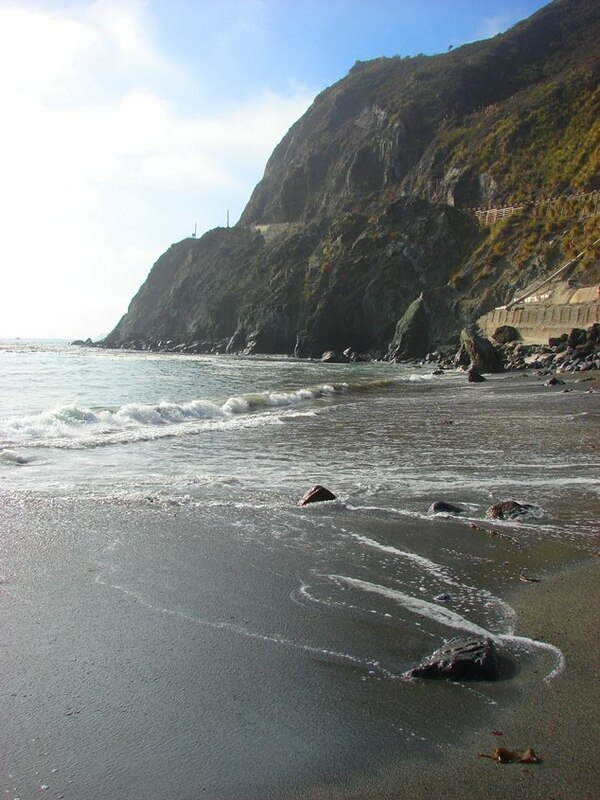 California has her faults, and faults are one of the ways that water can be forced to the surface. The grinding along fault zones produces a clay-like material called gouge, which is impermeable to water. Water flowing slowly underground can be dammed by fault gouge and forced to the surface. I visited two of those spots last week. The first is Cottonwood Springs at the less-visited south end of the park (picture above). Water still flows there, but only a trickle. During the mining era, some 3,000 gallons a day provided the only secure water source for many miles around. The palms were planted in the 1920s (though they are a native species). The cottonwoods were present earlier. Water has been present here for thousands of years, indicated not only by Native American grinding holes in the rock, but also from travertine-like rocks in the area, deposited by water over tens of thousands of years. Needless to say (but I always say such things anyway), the water attracts a wide variety of animal and insect life. 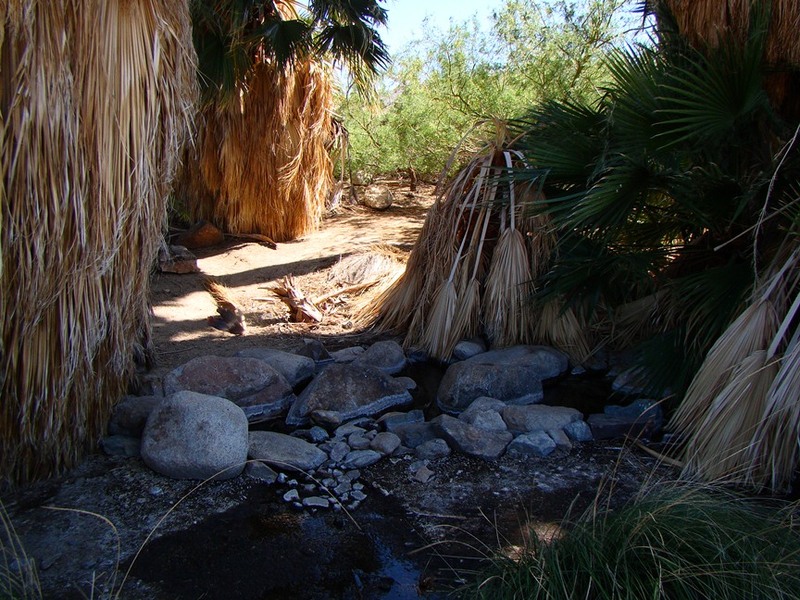 The second "spring" we visited was the Oasis of Mara in an outlier of the park that serves as park headquarters in Twentynine Palms. Early miners called the oasis "Twentynine Palms Oasis", but the present name is a derivation of the Native American name for the spot. The oasis is marked by a line of fan palms along a recently formed scarp formed by the active Pinto Mountain fault (visible in the picture above). I was fascinated by the beautiful little pond in the midst of the healthiest looking fan palms, but I soon realized it was lined with plastic. A bit of research (like reading signs on the nature trail!) revealed that the springs of the Oasis of Mara have been dry for decades. It's not too hard to figure out why. 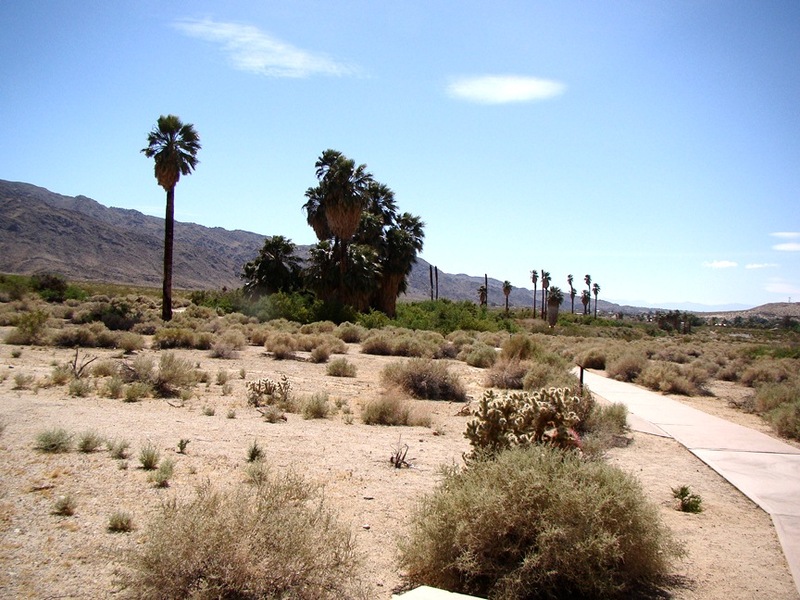 The presence of water led to the establishment of the town of Twentynine Palms, and the town residents started drilling wells right away, drawing down the groundwater table and and drying up the springs. I'm not sure there are actually 29 living palms left today. The last source of water we saw was a lake, of all things, hidden among the granite boulders. That's a unique Joshua Tree story for another post. Cates, Robert, 1995, Joshua Tree National Park: A Visitor's Guide, Live Oak Press, 100 pages. Trent, D. and Hazlett, R., 2002, Joshua Tree National Park Geology, Joshua Tree National Park Association, 64 pages. 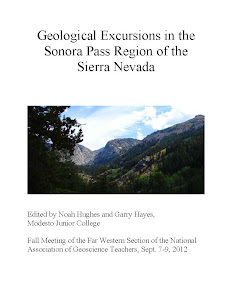 Eggers, M, editor, 2004, Mining History and Geology of National Park, San Diego Association of Geologists, c/o Sunbelt Publications, 119 pages. Where can one find the oldest rocks in California? And for that matter, any place west of Utah and Wyoming? Some well-seasoned geological travelers would point to the bottom of the Grand Canyon, where dark metamorphic gness and schist lie exposed below the Great Unconformity. Others might point to the Black Mountains in Death Valley National Park, where similar rocks are exposed along the unique turtleback faults of the deep graben that forms the main axis of the park. 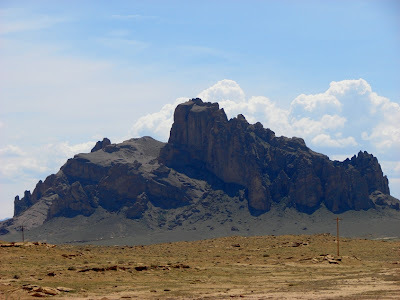 These beautiful rocks formed during a collisional event (really two) between 1.65-1.75 billion years ago that formed a huge mountain range that extended across the southern part of the North American continent for an unknown distance westward. At the time, most of the continents of the world were combined into a supercontinent called Rodinia (which existed prior to the better-known Pangea). 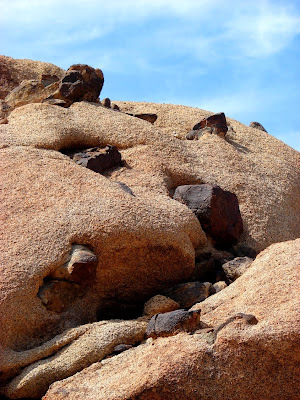 If one takes granite for granted, as I did once at Joshua Tree National Park, one might miss one of the unexpected pleasures of exploring the park. 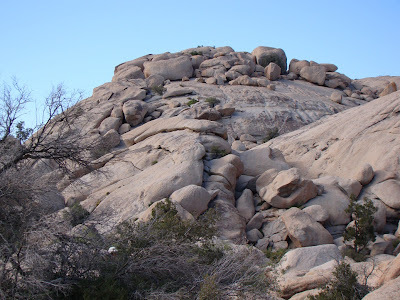 The giant granite boulders in the Wonderland of Rocks may catch most of the attention, but there are secrets in the somewhat bland looking hills in the south and central parts of the park: the oldest rocks in the state! 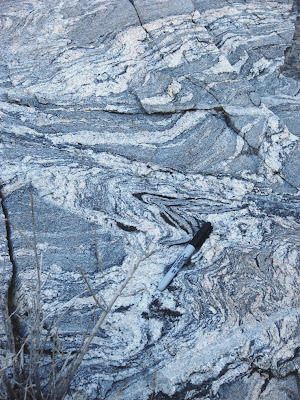 The Pinto gneiss and related rocks in Joshua Tree are related to those seen at Grand Canyon and Death Valley. These are the ancient metamorphic rocks that the granitic magmas invaded. These rocks once may have been sands on a beach some 2 billion years ago, or muds on a sea floor. Some may have been volcanic flows. 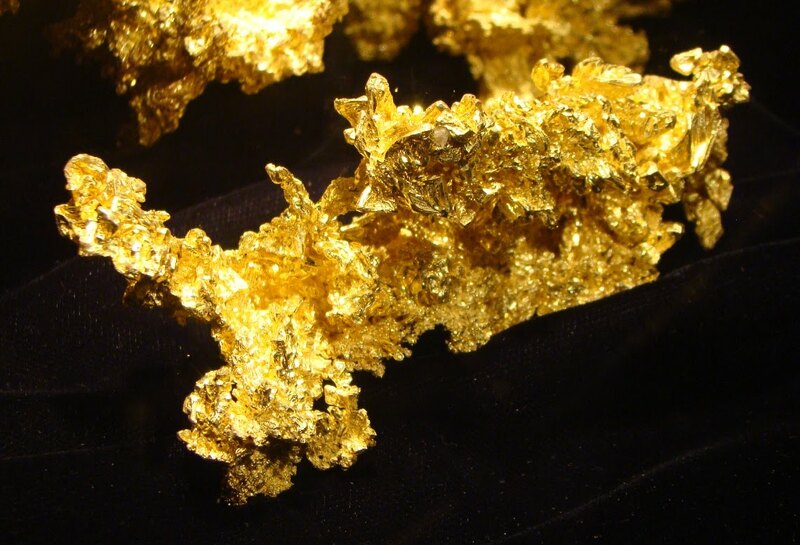 All have been baked by the molten rock and squeezed into their present shape. South of Cottonwood Springs at the less-used park entrance near Chiriaco Summit out of Indio, a desert gully along the park road exposes the contact zone between the granite and the gneiss (pronounced 'nice'). 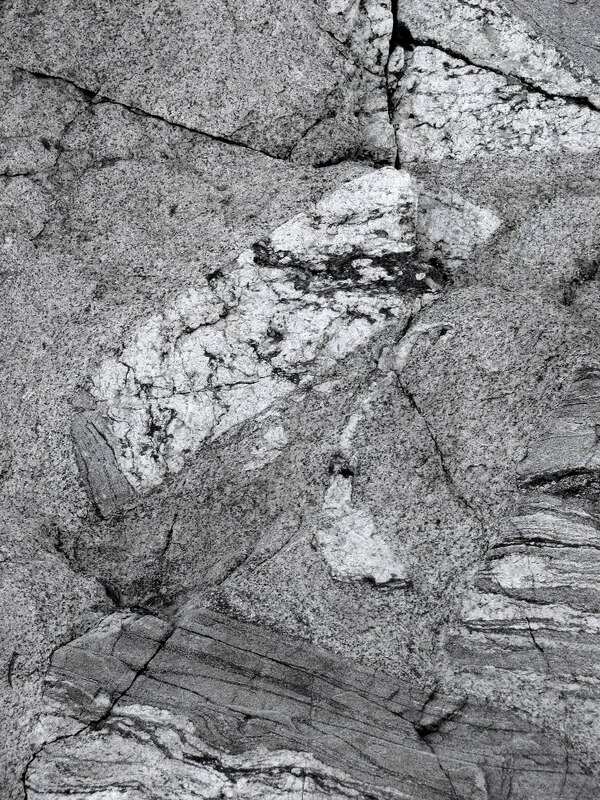 The contact is marked by an intrusion breccia, bits and pieces of the metamorphic rocks enveloped in the granitic rock. 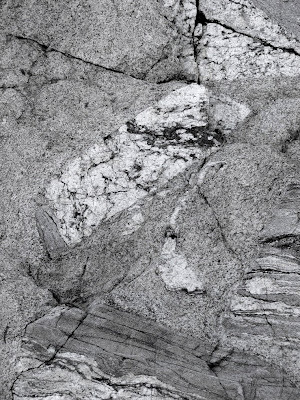 The isolated chunks of metamorphic rock are called xenoliths ('alien rock'). 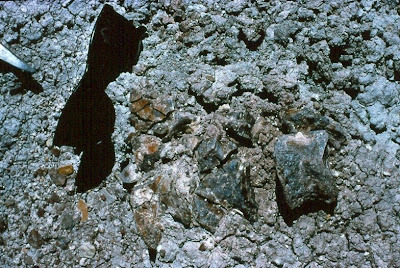 A hike to the Mastodon Mine out of Cottonwood Springs reveals one of the most unique exposures of xenoliths (or enclaves, see comments below) that I have ever come across. The metamorphic rocks are weathering differently than the granitic rock, and end up protruding like chocolate chips in cookie dough! 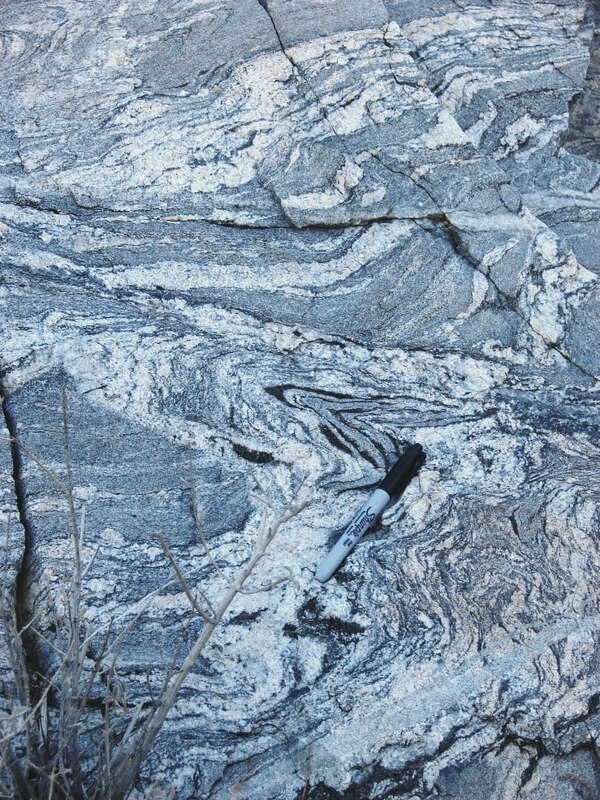 Taking Granite for Granted? Quick, Name a National Park in California! Which ones appeared first in your mind? Yosemite? Sequoia? Maybe Death Valley? 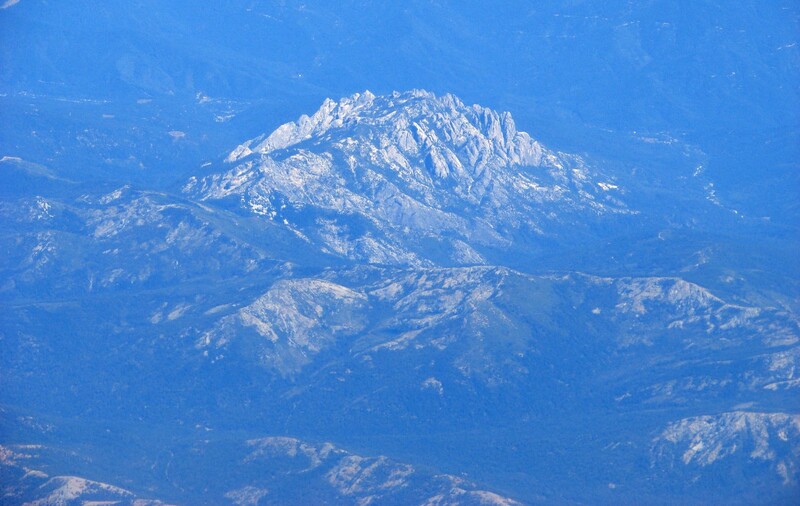 There are a few others, depending where you live, so Channel Islands, Redwood, or Lassen Volcanic might have been a first response. But who among you thought first of Joshua Tree National Park? As a native-born and bred Southern California, I am guilty of ignoring the treasure that existed in my backyard. National monuments often get short shrift as part of our nation's national park system, and I am not totally sure why. Many people don't even know the difference, but somehow assume that monuments are somehow a second-tier series of parks, places that are almost as good as national parks, but not quite. Under law, national monuments are the equivalent of national parks, but monuments are declared by Presidents under the terms of the National Antiquities Act, and national parks can only be established by Congress. What this has meant in practice is that Congress has often been reticent about establishing national parks, given the many pressures exerted by special interest groups and lobbyists. Presidents, acting as a representative of all the people in the country, have recognized the national value and significance of these sites, and have declared them to be national monuments to provide protection of the resource. Often, when a national monument has been in existence for a few years or decades, Congress finally comes around and establishes the monument as a national park. This is true even for some of our most iconic parks; both Grand Canyon and Zion were first declared national monuments before Congress acted in 1919 to make them national parks. There are numerous other examples. So, why am I talking about national monuments? Joshua Tree is a national park. 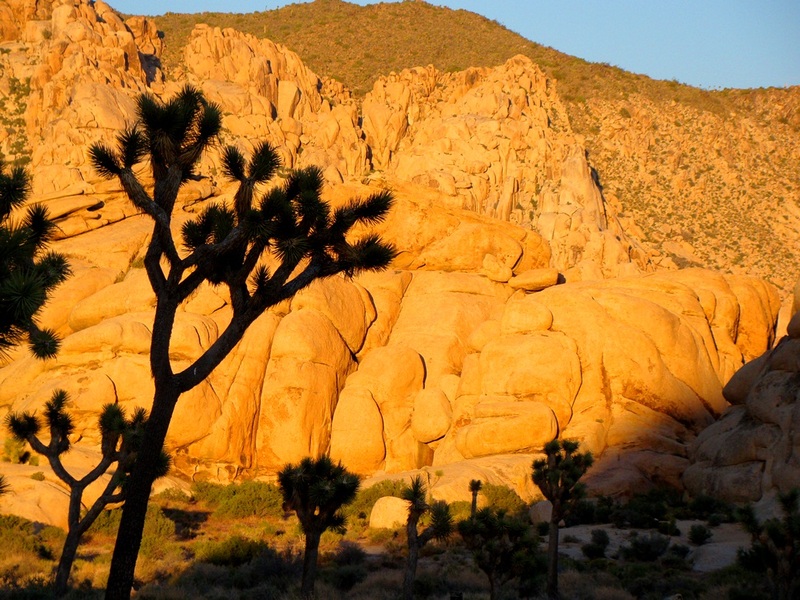 It turns out, though, that Joshua Tree followed a similar arc of many other park areas around the country. It was established as a national monument by FDR in the 1930s, and still was a monument when I was growing up in SoCal in the 60s and 70s. And I was guilty of thinking of monuments as second-class parks. When I dreamed of traveling, my heart was up in the Sierra Nevada somewhere, and I really didn't get to know Joshua Tree all that well, my trips being mostly confined to a handful of scout camping trips. I remembered a lot of big boulders, joshua trees, and vicious jumping cholla. Joshua Tree achieved status as a national park in 1994, along with Death Valley, another longtime national monument. And I was by then living elsewhere. These last few years I have been working to rediscover some of these places of my youth that I took for granted. 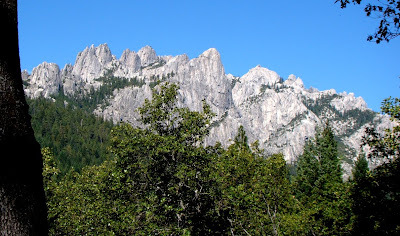 So I made a trip out there last week to check things out and found out that I was also taking the park for granite, too. There was a time when the our national parks seemed like unchangeable icons and symbols. They were protected from development, they were reservoirs of intact ecosystems and clean water and air, and a family might have told stories of camping in the olden days of the 30's and 40's, and until recently one could reasonably expect to have a similar experience in the current era. Times are changing, however. Glaciers are disappearing from Glacier National Park, forests and wildlife are transforming in parks like Yellowstone and Yosemite as the climate warms, and some parks are becoming isolated islands in seas of urban development. Views in parks like Grand Canyon, Bryce Canyon and Sequoia are increasingly obscured by air pollution. Our orphaned parks, the state parks, are being being closed for lack of funding. Others face privatization. It's a shame that the best idea our country ever had is being in some ways abandoned. I would love to think that we are coming up with better ways of caring for our national and state treasures, but I am not optimistic. When budget cuts come, the parks get cut first. I guess this is an odd way to extend an invitation! But if you live in the Modesto region (or are willing to make some major travel arrangements), we would like to invite you to travel with us on an exploration of some of our country's most precious places: the Pacific Northwest and the Northern Rocky Mountains. 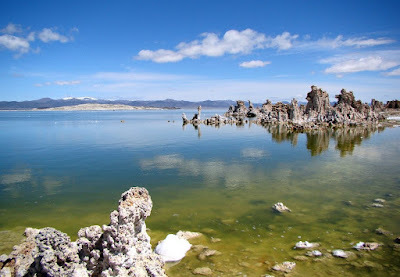 I'm working with our anthropology professor to offer a dyad class on the archaeology and geology of nine national parks and monuments (Lava Beds, Crater Lake, Newberry Crater, Mt. 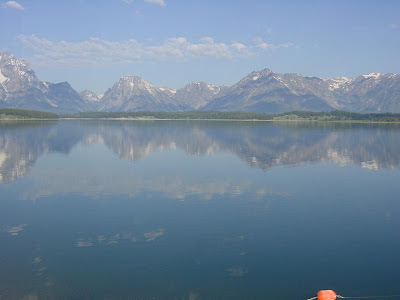 Rainier, Glacier, Yellowstone, Grand Tetons, Great Basin, Yosemite) as well as a multitude of state parks and other sites. And you can get three units of semester credit doing something interesting! That's not to say there will be no work...you have to learn stuff, and demonstrate it too us! And it is a camping excursion, with all the possibilities of rain, snow, sun, wind and critters. On the other hand, there will be plenty of opportunities to hike, to see starlight skies and wonderful sunsets, and to have a multitude of unforgettable and unique experiences. If you are interested, see the press release below for more information. We are having an informational meeting on Monday if you live nearby. We can provide info by e-mail if you can't come to the meeting. (Modesto, CA) — Modesto Junior College is offering a unique summer field studies course entitled Geology and Archaeology of the Pacific Northwest and Northern Rocky Mountains held June 15 to June 30, 2011. Anyone interested in enrolling in this special learning opportunity is invited to attend the orientation meeting on Monday, May 23 at 7 p.m. in Science 132 on East Campus. 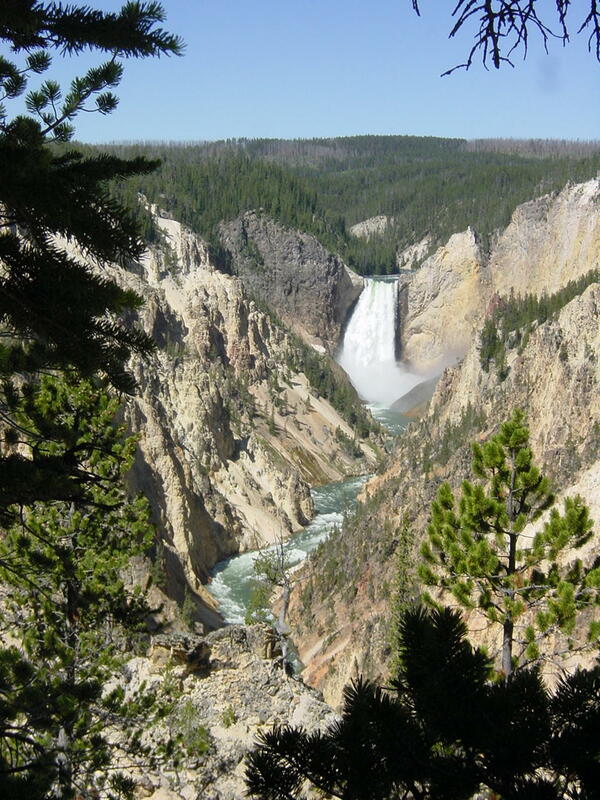 The course will provide an exploration of Yellowstone, Crater Lake, Grand Tetons and Glacier National Parks, and Mount St. Helens and Lava Beds National Monuments. Participants will also have the chance to visit and discover some less familiar spots that provide evidence of the geological and human history of the region, including Great Basin National Park, Berlin-Ichthyosaur State Park, Fossil Butte National Monument, and Newberry Crater. 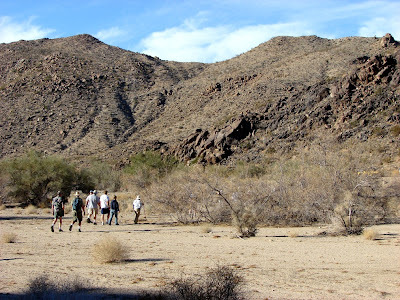 The new joint class is being taught by Professor of Anthropology Susan Kerr and Professor of Geology Garry Hayes and students will earn 3 semester units in either Geology 174 or Anthropology 174. A background is not required in either of these subjects. Basic principles will be developed prior to and during the course, and participation will benefit anyone interested in a career in teaching, park management and rangering, or science. The group will camp in the parks and monuments and the $650 class fee includes all transportation, camping fees, park admission fees, and food. A registration fee of $26 per unit is additional, as are other applicable fees for those not already enrolled as an MJC student. Anyone wishing to register for the class who is not already enrolled as an MJC student must submit an application online at www.mjc.edu. For additional information email Susan Kerr at kerrs@mjc.edu or Garry Hayes hayesg@mjc.edu or visit http://virtual.yosemite.cc.ca.us/ghayes/serv06.htm for a complete itinerary. If this post sounds negative, it's not. Please keep reading! There have been so many negative things of late in education around here, but I had a bit of a pleasant revelation today. Our very talented coordinator/volunteer convinced about half our college's sciences division to serve as judges for the regional elementary science fair. Sometimes one might see the results as evidence for the decline of scientific knowledge in the society, but actually...not really. These are some talented kids, and many of them worked very hard to learn something new. One can see some of the normal concerns of their young lives (which kind of bike can jump further? How long can glowsticks glow? ), but they learn. I was working through my section, and was handing out scores in the 70's and low 80's, until I got to the last two. I was impressed with the first one. Here was a kid who designed an experiment to test the insulating properties of a variety of substances, by constructing boxes that would hold funnels, an ice cube, and the insulating materials. He or she (names weren't revealed to us) kept a meticulous diary about his/her thought processes, the design and direction of the experiment, and a fine story board showing the results (aluminum foil won running away). Score I gave: way up there (scores aren't announced yet, in the highly unlikely event that someone associated with the event is reading). Then I sat down in front of the last poster board, and started scanning the results. There were none. There were the pictures of the experiment platform, the planted cups, bags of soil and fertilizer, and a graph of the results. The results? Nothing. Nada. Huh? I pick up the student's diary, and start reading the story. The search for a topic, the selection of the topic, the design of the experiment, the preparations, and the wait. Day one, no sprouts, week one, no sprouts, week two, no sprouts. Growing impatience...even frustration. Doubts about ever completing the science project. And finally, no sprouts, no roots, no nothing. EPIC FAIL! But no, not at all. No data, but a student unwilling to see failure. He or she drew up the poster board, reported the lack of results, declared an inability to support or disprove the hypothesis, and a presented a conclusion that explored all the things that might have gone wrong (interestingly, the leftover seeds thrown into the garden DID sprout, kind of like Jack and the Beanstalk). Sometimes experiments fail, but we learn so many important things from failure. It's one of the most important lessons of scientific exploration. I was impressed. Here was a student who gets science, and I hope he or she realizes it. We need kids like this in our society to be doing science as a career 10-15 years from now. Score? The highest I gave today. California's Shame: The State Mineral Exhibit to Close; What will you do with your 58 cents? 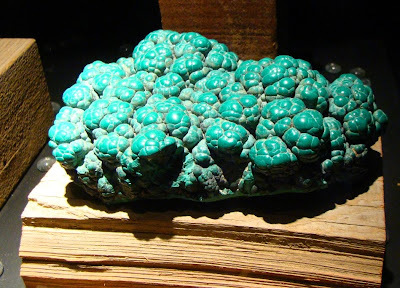 The CA State Mineral Museum - this is art, darnit! If you guessed that these are important geologic localities in California, you would be partly right, and if you guessed that these are parts of California's wonderful State Park System, you would also be right. But the correct answer to the question of the day is that each of these is a picture of a California State Park that will be closing in a few weeks because the legislature can't produce a budget. This, despite that fact that every dollar spent to support a state park produces something like four dollars of economic activity in nearby towns. There is a political party that is so adamant about not raising or maintaining taxes that they won't even let us decide as voters to continue taxes and fees that we are already paying to keep our parks open, to educate our students, to feed our hungry, to provide support for our unemployed. This political party thinks that despite the pain that nearly everyone in this state has suffered during our depression, the rich and well-to-do must not be inconvenienced by slightly higher taxes. It's more important to fire a policeman, a nurse or a teacher than it is to ask a person in comfortable circumstances to pay a bit more for the privilege of living in a society that allowed them to become rich. Kristin Olsen of the California state assembly? I'm talking about you. And Tom Berryhill of the state senate? I'm talking about you too. You supposedly represent me and my neighbors in Sacramento. Stop representing your rich benefactors, and try representing the people who live in your districts instead. Yes, I am angry. 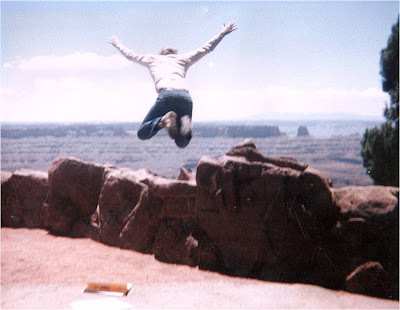 I've given up thousands of dollars in lost wages these last two years, and have lost the entire equity that my house accrued over the last twenty years, but I would happily pay a few more dollars in taxes to keep our parks open, and to help the state maintain the programs that keep our people healthy and educated. A hobbit named Frodo comes into possession of an evil magic ring. He finds a volcano, he throws the ring in, saving Middle-Earth, and he becomes a hero. The end. Isn't a little bit missing here? When we ask "are we there yet?" in our travels, we miss out on the value of the journey itself in our explorations. In the same way, the story of a mythological quest like Frodo's (or Luke Skywalker, or Perseus) is a journey, not a destination. The interest, the meaning, the richness of the story is in the insight gained by the hero (and thus the reader) along the way. If it is a mythological story, the hero will succeed or will not, but either way, it the journey that provides the significance to the success or failure of the quest. 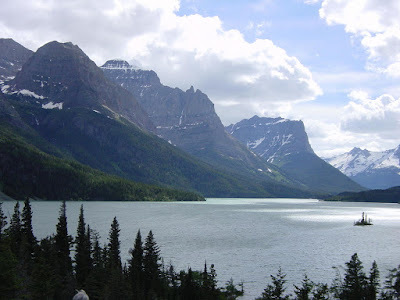 During the ice ages, a glacier blocked a major river drainage, forming a vast lake in Montana and Idaho. The unstable ice dam collapsed, sending a cataclysmic flood across Washington. Well. Look at that capsule description, note the resemblance to the LOTR version above, and you will understand the importance of the journey in geology. On our trip, we will follow the incredible flood in reverse, beginning at the mouth of the Columbia River, where the floodwaters poured into the Pacific Ocean. As we spend three days moving eastward, we will see deep gorges that were carved in hours or days by the rushing torrents. We will see deep caves formed by the swirling waters, and giant ripplemarks thirty feet tall. 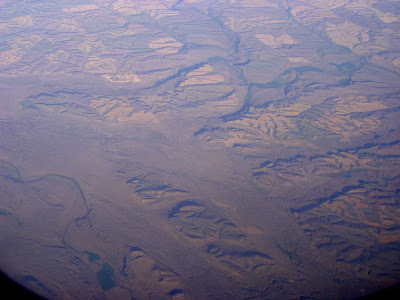 We will see a landscape in eastern Washington so stripped of sediment and soil that we call it the Channeled Scablands. We'll pass through the valley where the ice dam blocked the rivers and see the wave cut terraces and benches where lakewaters lapped against high mountain ridges. Think of the perspective one gains if while driving (or walking) across this landscape, for hours and hours, realizing that during the floods, this entire landscape was covered by water 300-400 feet deep, moving westward at the speeds similar to the velocity of our vehicles on the highway. The journey is everything in understanding the story of the Earth! Ironically, it took geologists a long time to accept the story of the Spokane floods. The narrative was put together in the 1920's by a teacher named J Harlan Bretz, who spent years collecting data and making observations across the region. Like shamans in the past, Bretz lacked some of the technology that would have made the story easier to prove (like aerial and satellite photography), but he scrupulously recorded his observations, and eventually his spectacular story moved from being perceived as a fable to being accepted as a firmly grounded geologic model. I'm looking forward to our journey! The picture above is a view of some of the flood channels in eastern Washington from 35,000 feet. 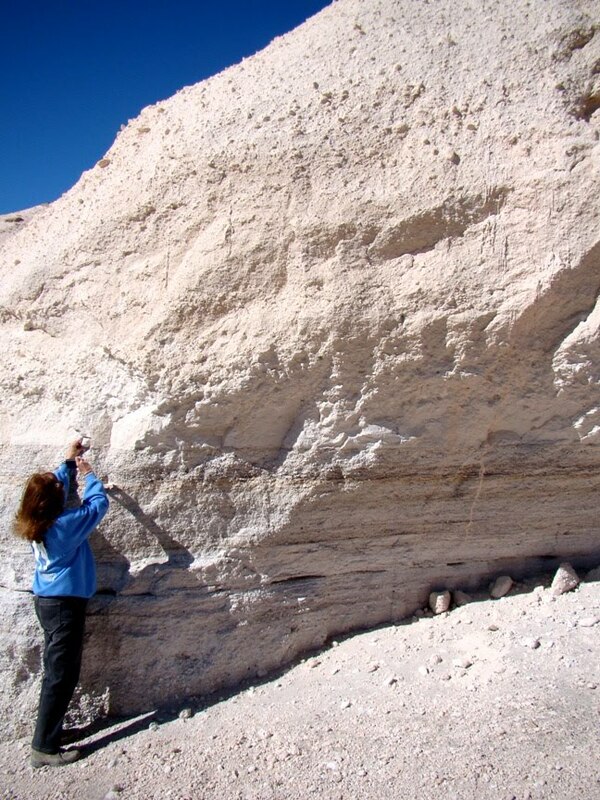 Living an Adventurous Life: Geologists...Really? I suppose that an adventure is just about anything that breaks up the routine and exposes you to something new. For a lot of people I am guessing that adventure has a lot to do with an adrenaline rush: I think of motorcycling, rock-climbing, bungee-jumping or rides at an amusement park. Others may think of adventure as exploration to the outer edges of space, beyond the reach of civilization, of the deep sea, the kinds of adventures that we might read about in National Geographic or history books. But how many people actually participate in that kind of adventure? Other adventures come out of mythology; the quest, the dangerous journey with an uncertain outcome. We don't see so many of those, but I wonder if a mythological narrative will arise from recent events concerning Osama Bin Laden and those who sought to capture or kill him. "They're, uh ... they're not a very exciting people, those geologists." Geologic hazards like volcanic eruptions and earthquakes have been fodder for movies and novels for decades. 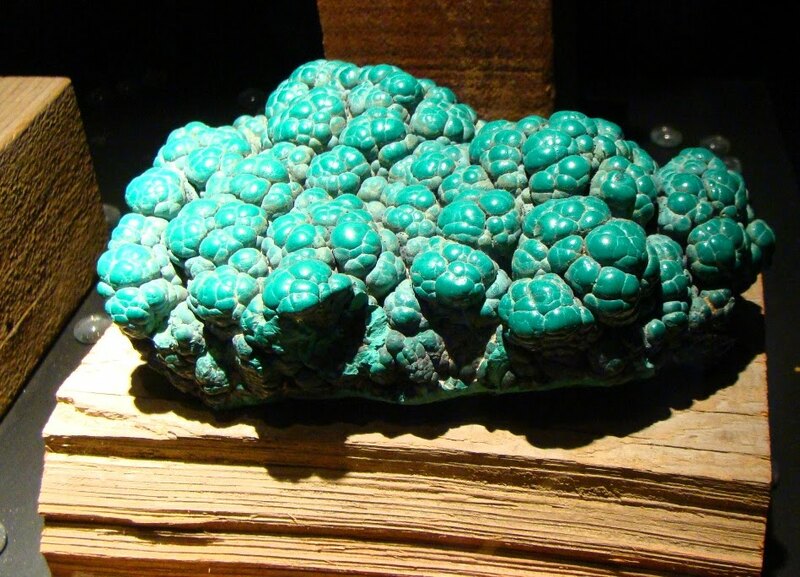 Geologists actually get to study these things as a part of their career. What a thrill to work on the flanks of an active volcano, monitoring and predicting future activity. 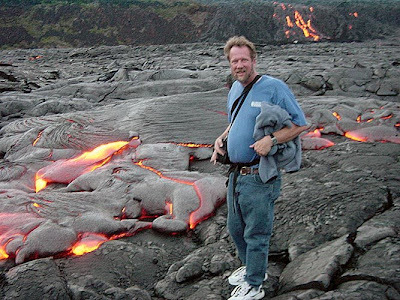 There is certainly an adrenaline rush when standing next to flowing lava! A nice bonus? They sometimes save lives with their research. The story of the 1991 eruption of Pinatubo in the Phillippines is a nice example. 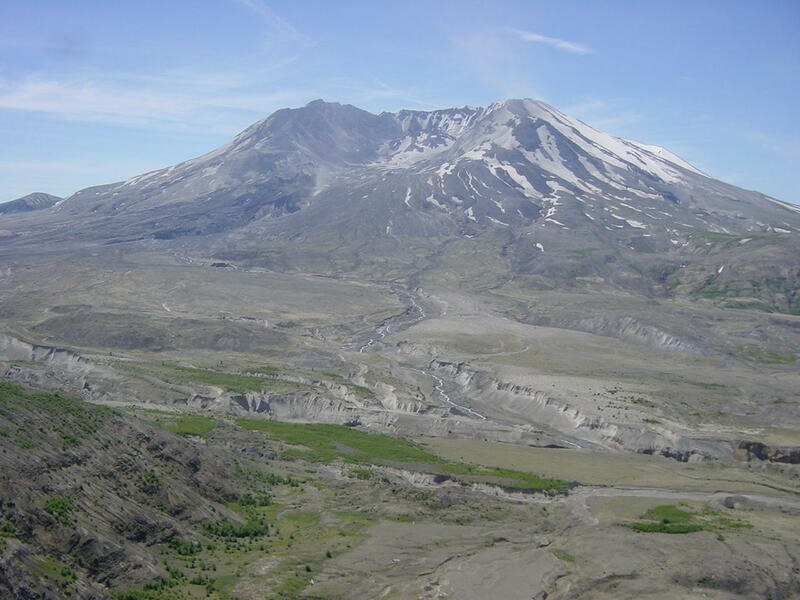 The eruption was the second largest event of the 20th century, and killed some 800 people. On the other hand, tens of thousands of lives were saved because of a timely warning to evacuate the region. This is all the more remarkable considering that during the height of the eruption, a typhoon swept into the island (it was actually the cause of the majority of fatalities). Even bad screenwriters and novelists don't even think to throw typhoons on top of volcanic eruptions! 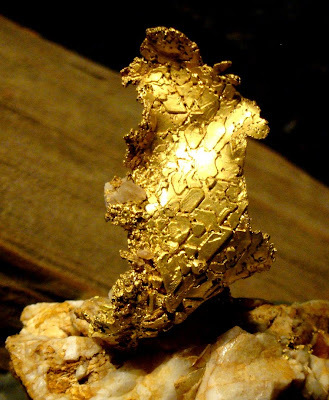 Have you ever wanted to be on an adventure to find buried treasure? 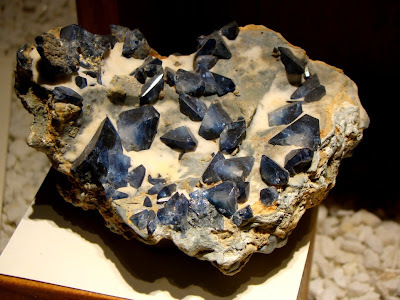 Geologists and rockhounders alike know the thrill of uncovering a rare crystal. It's hard to be in the field all the time without finding the occasional opportunity to search for quartz, garnet, topaz, or any other number of beautiful expressions of atomic-level symmetry. 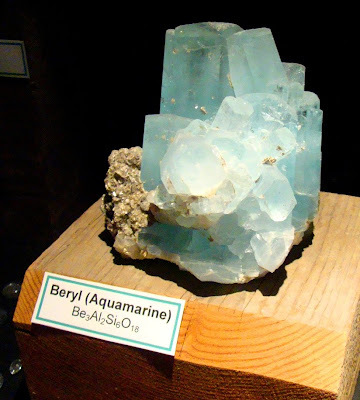 It's the rare geologist who doesn't have a small treasure trove of gemstones (or here) on a mantle or bookcase shelf. What about that childhood dream of finding a dinosaur? There is nothing quite like uncovering the bones of a creature that lived more than 65 million years ago. If you spend enough time in the right regions of the world, and you have enough geological background to know the age and nature of the rocks you are exploring, you can know that thrill (I'm not talking about a college education; there are geo-guides for the layperson that are full of accessible info about every region of the countryside). It's happened to my students (and myself) a fair number of times over the years. And there's no feeling quite like it. I was whooping like a kid (and promptly called the Utah Geological Survey; there's a right way to do these things). Did you ever imagine owning a time machine, of traveling back in time? 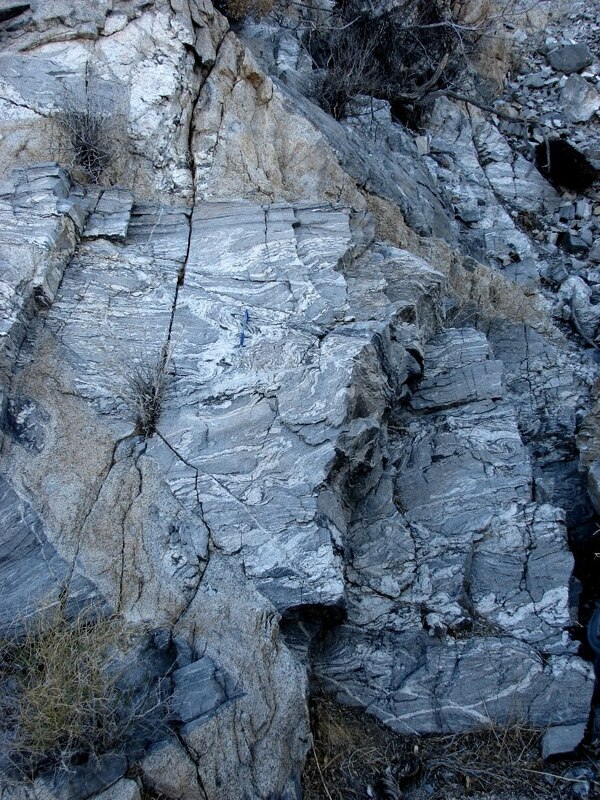 An understanding of the basic principles of geology is the tool geologists use to time-travel. It's effective; a bit of knowledge, and you can lay your hand on the surface that reveals incredible moments in the history of the world. In the picture below, I have my hand on the moment that the dinosaurs went extinct (via one of the most likely hypotheses). It is the iridium layer at Gubbio, Italy, where the Alvarez father and son team discovered evidence of a massive asteroid impact. In the other photo, we are looking at the moment that the Long Valley Caldera erupted at the north end of the Owens Valley in the Eastern Sierra around 790,000 years ago. More than 125 cubic miles of hot rhyolite ash filled the atmosphere and blanketed the region many feet deep, killing all living things. Do you need a movie to imagine cataclysmic events? It's a whole new experience to lay your hands on the moment that such events actually happened. A basic understanding of geology enriches one's life. National Parks are nice places to see scenery. A place like Yellowstone is interesting because you see bison and geysers. It is fascinating when you come to understand the nature of the "supervolcano" caldera eruption that produced the rocks and the active magma chamber that causes the geothermal activity. A visit to Yosemite is always nice, but it takes on a whole new dimension when you realize you are walking about inside an ancient volcanic complex not unlike Yellowstone's. You are exploring the underside of a volcano! During your travels this summer, stop by the visitor center and pick up a "Geology of..." book and read it. It can enrich your experience, and turn a vacation into a real adventure! Or, if you are in the Modesto region, consider taking a summer field study class in geology or archaeology at MJC (more on this soon! ).